Let me explain! 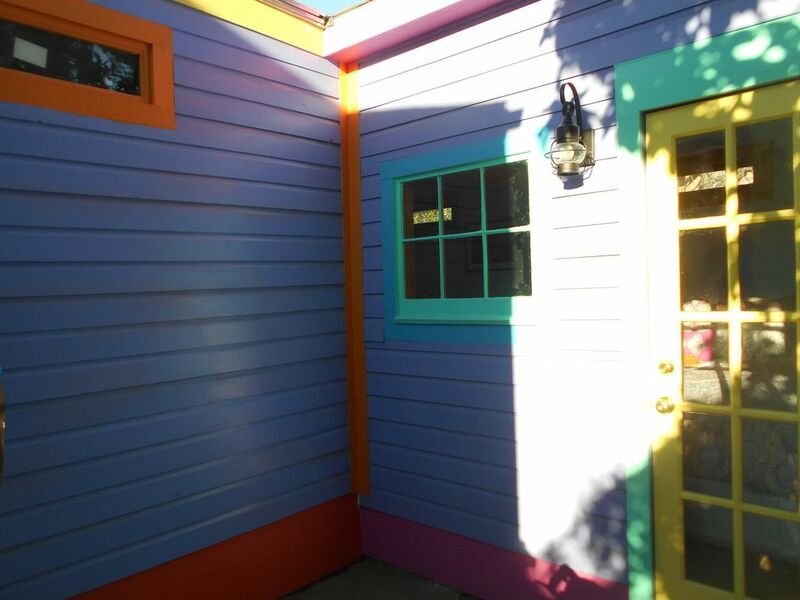 We offer a studio Cottage located in the rear of The Crescent City Cat Club, which is a cat cafe without the food. If you love cats, this could be the purrfect New Orleans getaway for you! Take a look at our home page on line, to get more info. Staying with us could be one of the highlights of your trip! All booking fees go towards the maintenance of the cats, who are all shelter rescues and are available for adoption. The studio cottage includes a kitchen, dining area, living and bed area, with a nice, big bathroom and closet. It is totally furnished, including gas stove, microwave, toaster, coffee maker, dishes, pots and pans, TV, bath linens, bed Just bring your clothes! In the heart of the Marigny neighborhood, steps from all the action on the St. Claude corridor, Frenchman St., The Bywater, and the French Quarter. Attached courtyard for enjoying your AM coffee or your afternoon beer and hanging with the cats. Live like a local while you're in New Orleans! The City of New Orleans short-term rental number for this cottages is 18STR-01484. I have lived in New Orleans for the past 24 years, having moved from California. I came for the music and never left! I have just retired from a 28-year career as a real-estate appraiser and historical renovations, and am now in the process of opening a Cat Club (adoption facility for shelter cats in a home-like atmosphere). I am also a certified dog can I say? I love animals! I also own the Mardi Gras Cottages, which has been a short-term rental for the past 3 years, and for which we have received more than 50 5-star ratings, so you can assume that this new rental will be just as attractive and well-run as those units. Come check us out. If you like live music and to be in the midst of things, this cottage is in very close proximity to the action, but somewhat removed behind a double-shotgun, with its own little courtyard. It is a free-standing cottage, so no shared walls, no too-close neighbors. Its proximity to St. Claude Ave., Frenchmen and The French Quarter is this cottage's most salient feature (along with hot and cold running cats! ), along with its brand-new renovation. Live like a local when you come to NOLA! Newly renovated. Shower/tub, lovely tile surround, brass fixtures, custom-made vanity, new toilet. We are located in the "Downtown" area of New Orleans, as opposed to the CBD, Uptown or Mid-City. The French Quarter is also downtown, along with The Marigny and The Bywater. All the pots and pans you'll need. Totally furnished, with microwave, gas stove, coffee-maker, toaster, fridge. Comes with coffee, filters, sugar, creamer. Loved the cottage! Exceeded expectations! The cottage was wonderful, it was everything we needed for the trip and located in a great area, close to transportation and easily commutable to the french quarter. Eshyah was an extremely helpful host and very responsive. We loved spending time with the cats and would definitely stay here again! Thank you! The cats and I always enjoy the company of cat people such as yourselves. And you're right....the location is great for exploring the city, with your own personal deli right across the street for instant, great food. We look forward to your return. lot of fun, place was nice and clean, close to everything and the cats added that special touch. We wanted to experience New Orleans without being in the bustle of the city. This location was 1 block away from the trolley and for $3.00, we could ride around all day. We visited some of the local establishments (all within walking distance). The grocery store and drug store are conveniently located a block away. The cottage is a secluded, whimsical studio that perfectly accommodates two people. The owner has compiled a packet that gives suggestions of things to see and do. She is pleasant and welcoming. I fell in love with the cats and kittens. I was sold as soon as I learned proceeds go to the cat rescue. We will certainly return to the Crescent City. Hopefully, we will find this rental available when we do. Thank you so much for making our stay delightful. Thanks for taking the time to write such a nice review. We look forward to welcoming you back. We enjoyed every moment of our stay at the Crescent Cat Club Cottage. The cottage is perfect with everything one needs for a home away including access to the most precious cats and kittens! Due to a glitch in our plans (of our own making) we were without lodging for the second half of our trip and Eyshah was so kind to find us the Mardigras Cottages which was perfect for the remainder of our stay in New Orleans. If you are into live music, this is your spot! We are 1 block from St. Claude Ave., where you will find Siberia, Hi-Ho Lounge, Allways Lounge, and The Marigny and Bywater neighborhoods, where there are literally hundreds of bars, restaurants and music venues. We are steps from Frenchman and The French Quarter, which provide ANOTHER ton of restaurants, bars and music, not to mention killer architecture and history on every street corner. In general, New Orleans is like Disneyland for adults, and our area is Sleeping Beauty's Castle. Too much fun! The seventh night of any stay is FREE!